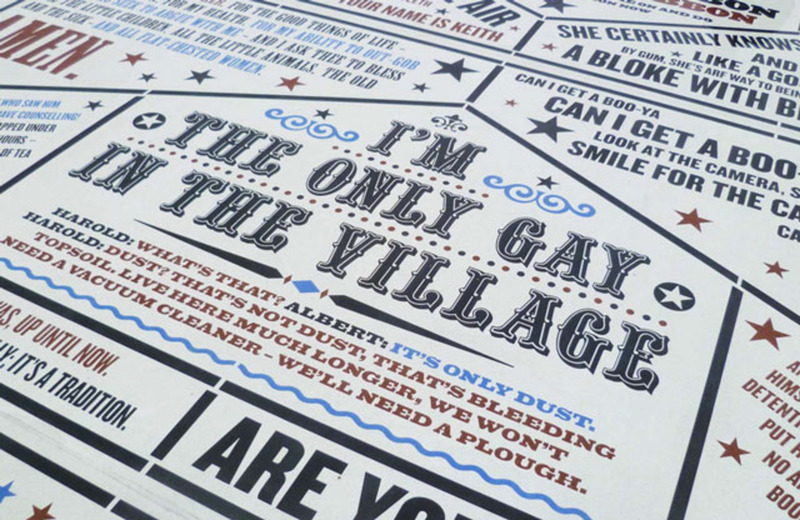 Joint overall winner of the ISTD’s 2014 International Typographic Awards, the Comedy Carpet represents a tour de force for designer Andy Altmann of Why Not Associates and artist Gordon Young. 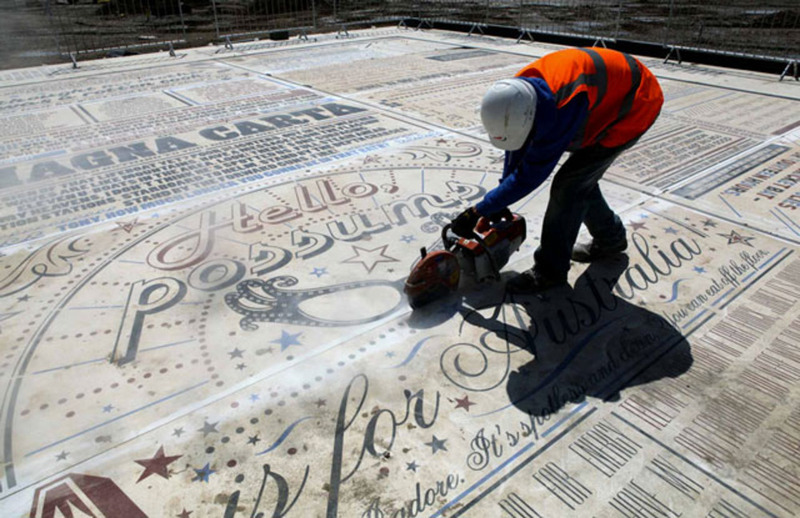 An outdoor typographic playground on an unprecedented scale which appeals to young and old alike, it’s a project which the people of Blackpool quickly took to their hearts. Held every three years, the ISTD’s International Typographic Awards is the only awards scheme which recognises and awards typographic excellence within design. 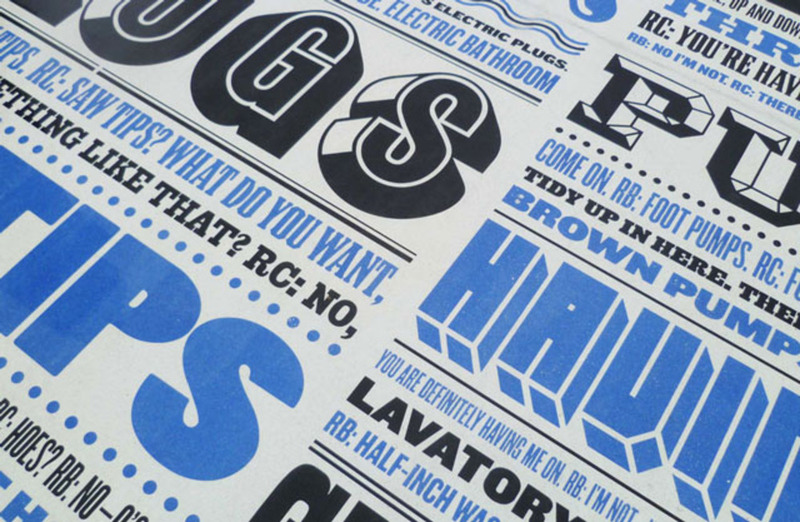 Beating off stiff competition, the Comedy Carpet was joint overall winner (along with the beautiful publication Eros and Thanatos by Maria Magdalena Koehn and Maria Ondrej) of the ISTD’s 2014 International Typographic Award, which was presented at a very memorable evening held at the De La Warr Pavilion in Bexhill. 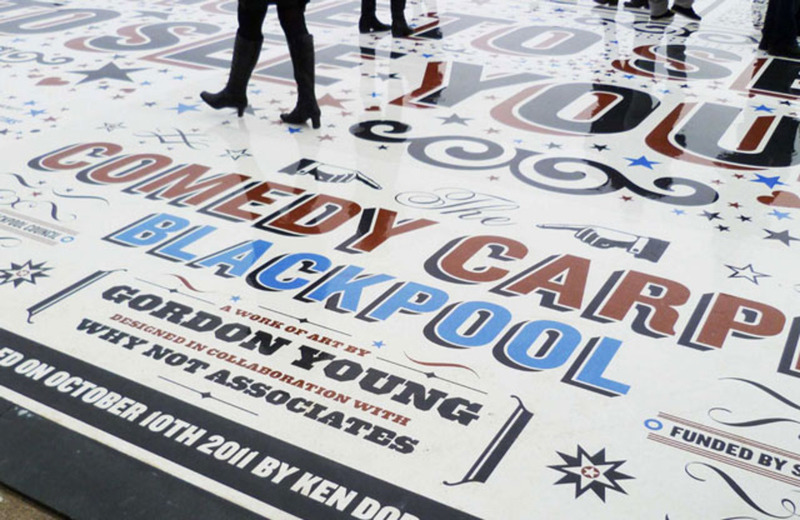 Since its launch, the Comedy Carpet has attracted a good deal of publicity, and a little controversy – there was a huge outcry when Blackpool Council decided to remove a section due to Health and Safety concerns. We caught up with Why Not Associates' Andy Altmann to find out how he feels now about the award-winning project, and what he learned during the process of making it. Nearly three years on, is the way you view the Comedy Carpet any different to when it was first launched? When the Comedy Carpet was first opened to the public it was the accumulation of five years work from the initial moment Gordon Young told me about his concept. By the end of that journey I could hardly see straight, in terms of design and what the overall impact would be. It was just a massive relief that we finally got there. To be honest I have only revisited the carpet a handful of times since it opened. But the most rewarding thing in those visits is watching how people interact with the content. Slowly wandering around, chuckling, commenting and even singing. It's the most rewarding project I've ever been involved in as it still seems to touch people on a daily basis. Locals return to discover new things as the content is vast. I even met a couple on there who said they had come to look just to cheer themselves up after the mother-in-law’s funeral – very Les Dawson. 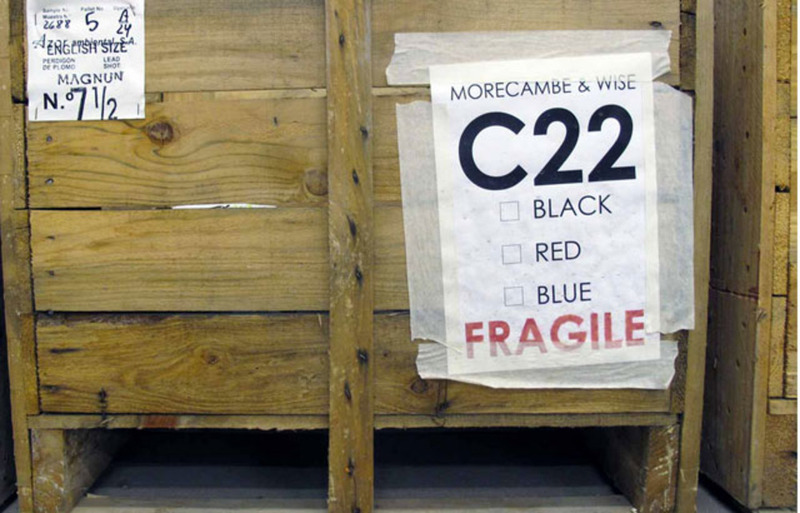 What were the biggest challenges you faced during the making of the Comedy Carpet? Were there any sense of humour failures along the way? There were many unfunny moments all the way. Gordon and I fell out at times. Slabs were smashed on site. There were tears as well as laughter. The biggest challenge for me was taking on the research with Gordon for all the content. I became obsessive, reading lots of comedy books, scripts and comedians’ biographies, plus I watched hours of film and television clips and listened to old radio shows. I even had to buy an old cassette Walkman to listen to things that existed only on tape. The design itself was a challenge and I stupidly attempted to design it on my own (obviously collaborating with Gordon), but towards the end I cracked and had to get help from other designers within Why Not. I literally could not see straight and it needed fresh eyes. However I think the biggest challenge of the project was the actual manufacture and installation, which was led by Gordon, who opened his own factory in Hull to make it. He assembled an incredible team of people to produce something that had never been done before. It was a brave decision which involved many risks. What was the most important thing you learned while working on the project? I guess the most important thing I learned was the value of collaboration. Working with Gordon, and working as a member of a team, all with one goal – to produce the best result we could. 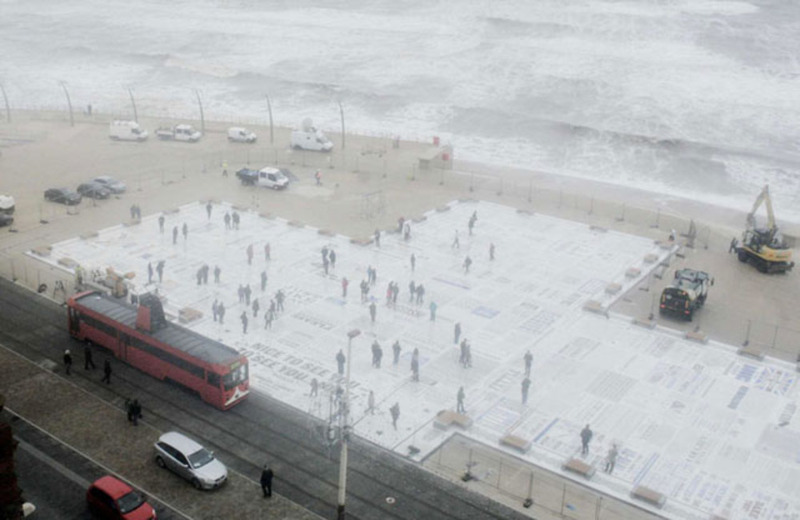 The Comedy Carpet has been used as an educational space, a place for remembrance, celebration and for protest. Were you surprised at how it has been embraced by the people of Blackpool? It's been really rewarding to see how the people of Blackpool have embraced the Comedy Carpet. I wasn't really surprised, but I never really thought about what people’s reactions would be while designing it. I was just very happy to see how the local people began to take ownership, and that it became part of the new popular culture of Blackpool. Given that the cultural references are so intrinsically British, have you been surprised at the project’s international appeal? The content of the Comedy Carpet is so British that any foreigner would have difficulty in understanding most of the references. However it has proved to be incredibly popular with people all over the world. I have given talks in places like Japan where it's hard to explain such things as 'knickers, knackers, knockers' or ‘discumknockerated'. I think it has massive appeal to designers around the world just by its sheer scale, and the fact that nothing else exists to compare it to. Has the project lead to any interesting or similar commissions? 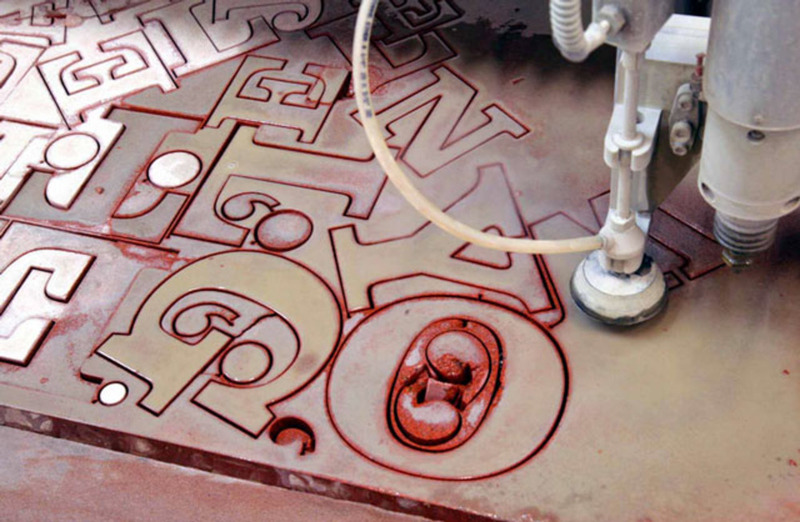 We worked with Gordon on his MK Rose project following the Comedy Carpet. 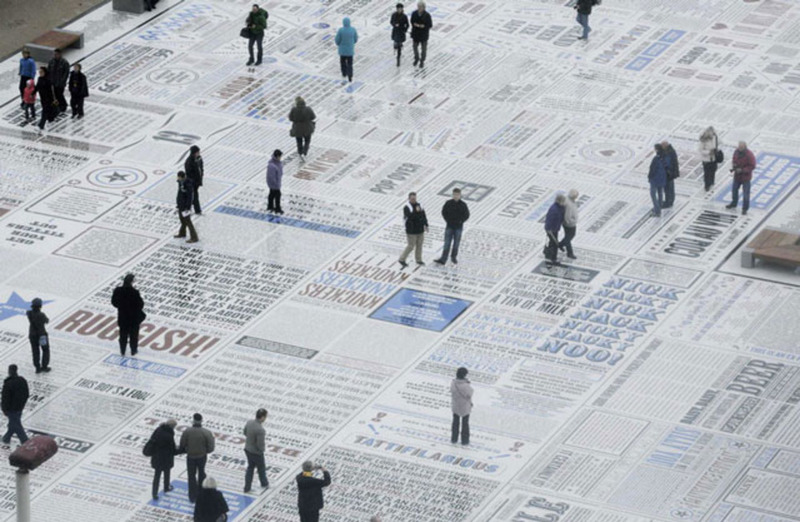 Although it was a more modest project in scale and the use of typography was more minimal, many of the lessons learned in the making of the Comedy Carpet were put to good use in Milton Keynes. There are no typography jokes on the carpet but my favourite would be: Comic Sans walks into a bar and the barman says “We don't serve your type here”.